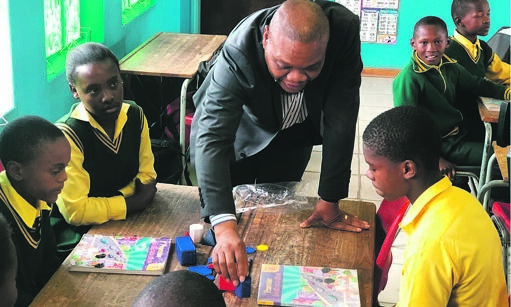 THE PARTNERSHIP between the Free State Education Department and Kagiso Shanduka Trust is celebrated as an example of public and private unity that makes Mzansi better. The trust is a collaboration between Kagiso Trust and the Cyril Ramaphosa Foundation. They aim to collect all the best education practices to create an education intervention system that can be customised for each district. The reward for attaining excellence is infrastructure development, which is based on two categories: basic infrastructure and incentivised infrastructure. Basic refers to the building or renovation of ablution blocks, classrooms, perimeter fencing and the supply of desks and chairs. All programme schools receive basic infrastructure where it is required and not already being provided by government. Incentive refers to special facilities such as science laboratories, libraries, computer centres, maths centres, multimedia centres and sports facilities. Select schools that perform above the target set by the department of education, qualify for incentive infrastructure projects. SHS Mofube Primary – it had two new classrooms built because it attained an average school pass rate of 70%. Reaitumela Primary got a new eating area and kitchen area as well as its library renovated for attaining a 97,1% average pass rate. Phephetso Secondary had its computer lab renovated for attaining an impressive 94,5% pass rate in last year’s national senior certificate examinations.